Many Baltic Sea cruises begin or end in Stockholm, one of Europe’s most elegant and beautiful cities. There is a one-day excursion you can take on your own while in Stockholm that will be an enriching experience. Visit Uppsala, Sweden’s fourth largest and one of its oldest cities, dating back to 10th century Viking culture. Uppsala gives you a chance to experience Swedish life outside of the metropolitan environment of Stockholm. It is easy to reach and offers many interesting sights. Trains depart from Stockholm’s Central Station for Uppsala approximately every 40 minutes. The train journey takes around 45 minutes and you arrive in the heart of Uppsala. If you spend a few Kroner more and travel in the first class coach it is quiet and never crowded. The coach has plush velvet seats and is a reminder of a bygone era. Gamla Uppsala – A few miles from the railway station is the site of the earliest Viking settlement. Dating back as far as the 3rd century, there are numerous burial mounds, a royal mound and a fascinating museum. Uppsala Cathedral – Started 800 years ago, it is one of the two largest brick Gothic cathedrals in Europe. Originally it was a Catholic house of worship, but today serves as the church for the Archbishop of Uppsala, Primate of the Lutheran Church of Sweden. Uppsala University – Dating back to its 15th century founding, this is one of Europe’s great academic institutions. Visit the Museum Gustavianum, see its large astronomical collection and special Carl Linnaeus exhibit. Visit the beautiful Linnaean Gardens originally designed by world famous scientist Carl Linnaeus. 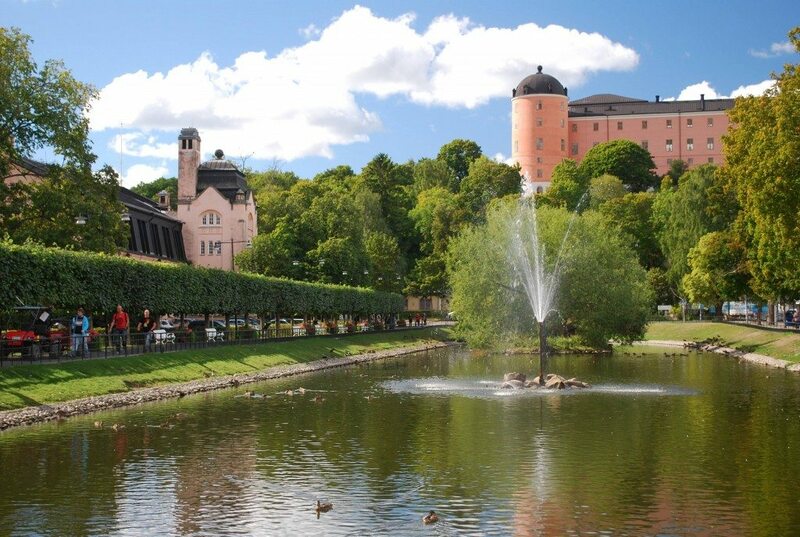 Uppsala Castle – Built in 1549, this was once the seat of royal power until the early 18th century when Stockholm became the capital. Today it serves as the seat of government for Uppland County, and it contains the Uppsala Art Museum. It was once the childhood home of Dag Hammarskjöld, former United Nations Secretary General when his father was the Uppland governor. Downtown Uppsala – Along the Fyrsis River, the city’s downtown is filled with many elegant buildings housing excellent restaurants, shops and coffee houses. Stadsträdgården – Walk through this beautiful public park bursting with flowers and situated along the banks of the Fyrsis River. Linnaeus Hammarby – The summer home of the great scientist Carl Linnaeus, the famous 18th century botanist-zoologist who developed the taxonomical classification system. Linnaeus Museum – Located in the city center, this museum chronicles the life of the famous scientist whose taxonomical classification system is so much a part of our scientific literature. As a university city and former royal capital, Uppsala possesses a charm and air of grandeur that makes it a delightful place to visit while in Stockholm. And the train journey also gives you a chance to catch glimpses of the verdant Swedish countryside.